» My Third Month Blog Income Report – How I Made $71.49! Another month has passed and now it’s time to write about my third month blog income report! In my third month, several significant events took place which were both exciting and dreadful for me. I was publishing new posts and creating pins for those posts as usual. After getting the new year off to a good start, my Pinterest views started plateauing together with my traffic. So I asked myself, what can I do to overcome the situation? Then I decided to do something. What I did was nothing new but as it turns out, it worked to my favor. I immediately saw a surge in my Pinterest views and traffic. I was happy. Then, out of nowhere, I received an email from Pinterest that nobody wants to receive. My Pinterest account was suspended! Of course, I appealed but the appeal was rejected. I could see all my efforts went down the drain just like that. It was devastating. Without Pinterest, my blog progress came to a grinding halt. It was pushed back at least six months behind my original goal. However, I believe the suspension had nothing to do with my little experiment. I think it was something else that I did on that platform. So what did I do to overcome the traffic plateau and what caused my account suspension? I’ll answer these questions below so please keep reading if you want to learn what happened. This is going to be an interesting post! I Made $71.49 in My Third Month Blogging (Jan 2019)! For the context, I started this blog on 1st November 2018 with 0 posts and 0 Pinterest followers. I started counting my income as soon as I published my first post. This income report is my 19th post in this blog so far. Here’s how my Pinterest views look like for the past three and a half month. For the first time, I am approaching the 200k Pinterest views mark. I am aware that Pinterest views is not the most important metric to track but to me, it gives a general indication of my progress. So it’s not totally useless. As your Pinterest views increase, so do the traffic to your blog and its income, at least that’s the case for me. It helps that I usually pin 80-90% of my own content. In contrast, I read how some other bloggers who get millions of Pinterest views but get similar traffic to mine. That can happen if you pin a lot of other people pins or your viewers are not actually clicking on your pins. Later, I’ll explain more what I did to overcome the plateau and why my Pinterest account was suspended! I’ll also share some tips on what you should do if you find yourself in a similar predicament. In fact, I’ve never bought a blogging course aside from small rare purchases to learn something specific that I am not familiar with and to save time. I am a self-taught person when it comes to blogging. I’ve been making money online full-time since the year 2000 and started my first blog in 2006! In this post, I’m trying to show what is realistic and achievable. It goes to show that you can actually start making money in your early months of blogging just by doing the right things. That being said, most new bloggers do not make any money in their third month, let alone in their first especially if one starts with 0 posts and 0 followers in the first month. So I would say this is not a typical result. However, it wasn’t even my goal to make money in my first-month blogging, it just happened after I laid the groundwork. If your blog failed to generate any income during the early months, don’t worry, that’s quite typical actually. You can just learn what I did and follow my tactics! It’s exciting to see how my income and traffic increase month after month. If they don’t, I know I must be doing something wrong. Like many other blog income reports, I will also be recommending tools and resources that I’ve personally used that helped me achieved the result. 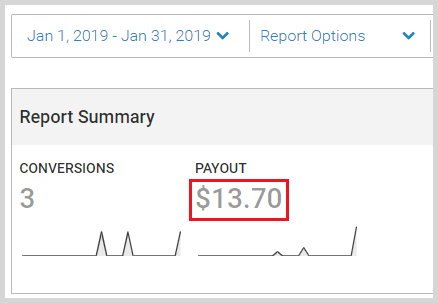 My third-month blog income (January 2019) increased by 153% from $46.76 in the previous month to $71.49. I am going to show screenshots from my affiliate dashboard to show that I am not making this up (even though they are not much!). My AdSense income actually dropped from $34.86 in my second month to $32.79. As I mentioned in my previous month blog income report, my January 2019 RPM is lower than that in December. This is because of the ad revenue slump. It can be harsh especially in January as advertisers decreased their ad budget after the big holiday spending. Thankfully, the drop wasn’t severe for me as the increase in traffic and impressions compensated the loss. Still, I wish I could have made more! My second largest revenue source is Survey Junkie where I earned $19.50. Survey Junkie is one of the most popular online survey affiliate programs. From a blogger perspective, I find it’s pretty reliable and has better conversion rates than the other paid survey offers. You can sign-up with Survey Junkie here and start making money from your blog promoting free survey offers to your readers. They’ll pay you $1.50 for each sign-ups. Panthera Interactive is an affiliate network offering mostly CPA offers. I’ve made $13.70 from Panthera Interactive in my third-month blogging. For the first time since I started this blog, I’ve made money from FlexOffers. It came from the promotion of Paribus, a free app that gets you refunds and cash back. You can join FlexOffers here. My last income source is from ShareASale. It’s also the first time I made money from them in this blog. I made money from PinchMe, the free sample program that mails you samples of free products. This is a free stuff blog after all! People also sign up with the freemium Tailwind offer which is a Pinterest scheduler that I recommend highly because of the ease in getting traffic without much effort. Finally, I got two sign ups for Grammarly which is a free online spelling and grammar checking tool. Want to promote those offers in your blog? You can join ShareASale here. For the first time since launching this blog in November, I broke the 300 visitors count in a day. 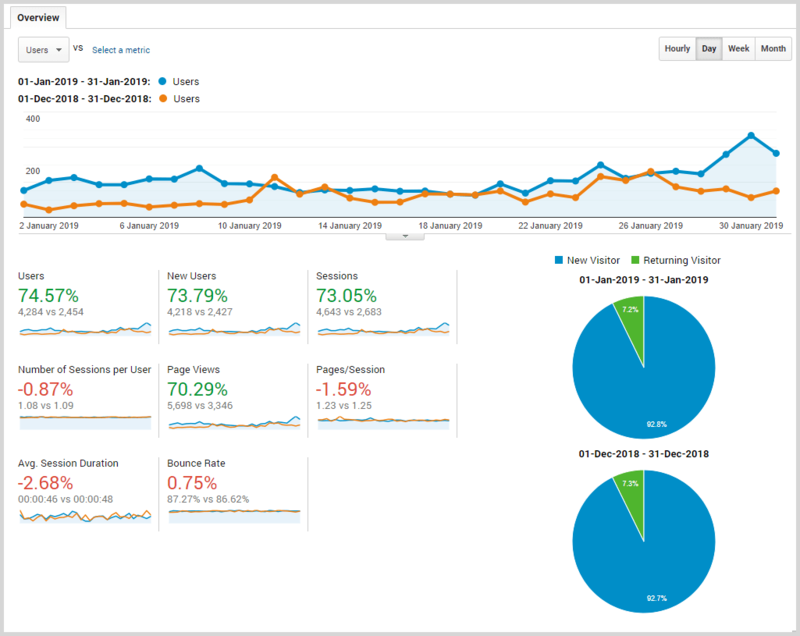 Overall, I had more than 70% increased in views, sessions and users in January as compared to December 2018. Like I mentioned earlier, my Pinterest views started to plateau a week into January. I had a hunch that my old blog posts starting to lose traction and their reach may be decreasing. My new posts and pins were only enough to maintain my current views and traffic level but not increase the numbers. I know Pinterest likes new and fresh content and this can include new pins and new descriptions for older posts. So that’s what I did! I created new pins with new descriptions, with better design style and more catchy headlines for ALL my pins. There were only about 17 of them so it wasn’t too much work to create new pins for them. Then around three days later my traffic and Pinterest views started to pick up again. So the moral of the story – if your Pinterest views are stagnating and traffic is not growing, design new and better pins and write new descriptions for your older posts! Next question – how did I get my Pinterest account suspended? Well, obviously it has nothing to do with the creation of the new pins. I think I was messaging a few too many pinners, like seven, via Pinterest messaging requesting to join their group boards. Because I like to work fast, I did it in a matter of minutes. Apparently, that’s enough to trigger Pinterest spam detection system which automatically flagged my account for spammy activities even though I wasn’t spamming. My account was suspended while I was typing a message. How do you get your Pinterest account reinstated? My first appeal was rejected. In fact, for that appeal, I was required to click a link in the email without having to enter any information. So I was not sure if there’s a manual review done. Sending an email to creators-support@pinterest.com saved me from a complete disaster. They manually reviewed my account and actually visited this blog the next day and then reinstated my account. So if your account is suspended, write a polite email to that address and explain your situation. There are good people at Pinterest who will listen to your case. Instead of repeating what I wrote in my previous income reports, I’ll try to include new information below. If you want to get more context, please check out my previous blog income reports. My goal was to write at least one long-form content per week. I tried writing two, even three posts but when my aim is to write 2500 to 5000 words per post that require research, it is quite hard! So I only managed to publish six posts in January. I used to think that publishing one post per week is enough. I still think it is. But that should be the minimum. Today I am of the opinion that a blogger should publish as many posts as he/she can in a week as long as the quality is maintained. This is very important during the early days of your blog because with many posts there’s a better chance your traffic will explode once Google gets the chance to rank your content. If you are worried about overwhelming your readers with constant postings. Don’t. Nobody comes to a new blog (or any sites for that matter) and get overwhelmed by the number of posts – may be only a few. Most visitors will only read/scan posts that are relevant or of interest to them and off they go. In the future though I plan to hire writers to help me churn out more posts faster. As a non-native English speaker, I am aware that my writing is not the best in the world. So, I’ve been using Grammarly to help me fix my grammar and spelling. Grammarly is an online spelling and grammar checking app that helps users find and correct English writing issues. While it didn’t help me write like a native English speaker would, it has definitely improved my written English and helped me create more engaging posts. This is the secret behind my steady growth in traffic and income. Now that the cat is out of the bag, let’s talk specifically what I did. The free trial lets you schedule and publish up to 100 pins. However, to get most of Tailwind, I would highly recommend upgrading to the Plus plan. Tailwind Plus account costs $15 per month, or if you pay annually as I did, it costs $120 and you get 4 months free. Your monthly payment comes down to $9.99 per month. Personally, I thought $120 is still a little pricey for a scheduling tool. But I don’t want to wait for months or a year to start getting meaningful traffic to my blog so I bit the bullet and paid for it. As it turns out, it’s one of the best investments I have made online. I am always looking forward to seeing my traffic increasing. 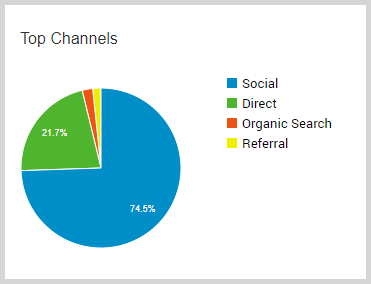 Currently, at around 74.5%, the social channel is my largest source of traffic and Pinterest made up the bulk of that traffic. The plus account is perfect for bloggers and small businesses. My advice, don’t hesitate to upgrade to the Plus plan if you’re serious about driving traffic to your blog. By the end of January, I’ve joined 91 group boards! That’s 36 more than in December. If you want to know how I was able to join so many boards, check out my first-month blog income report. Going forward, I am going to slow down a little on joining new group boards. Instead, I want to focus on my own niche personal boards. If you want to know whether personal boards can bring in the traffic, wait for my next blog income report! As I mentioned earlier, Pinterest loves new content and this includes new pin design. After some research, I settled with a design that is fresh, clean and has a more consistent branding. I’ve learned that old pins can start to fall out of favor with Pinterest so you’ll have to continuously create new pins for old posts to keep the momentum going. I continue to optimize my blog posts for the search engines. I don’t get much organic traffic yet but this is for the long-term. I expect to get more organic traffic in May 2019 onwards, fingers-crossed. I also performed keyword research to find popular topics I can write about. For that, I’m using KeySearch. 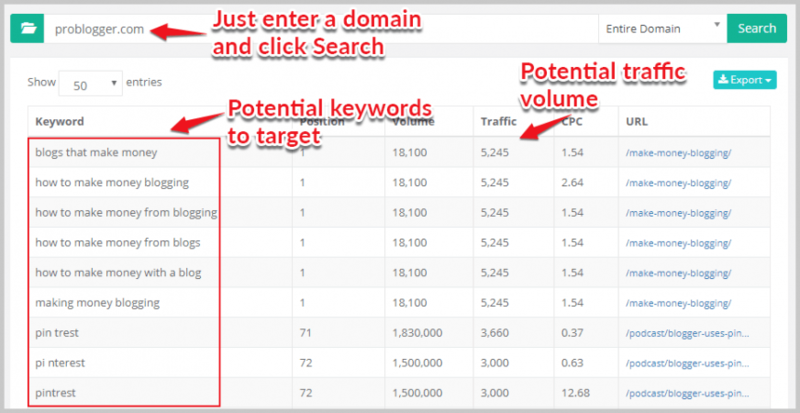 KeySearch – most affordable professional-level keyword research tools. Use KSDISC coupon code to get a 20% discount. Instead of paying $17 monthly, you’ll only pay $13.60 monthly until you cancel or upgrade your plan. Survey Junkie – get paid for promoting high converting survey offers in your blog. 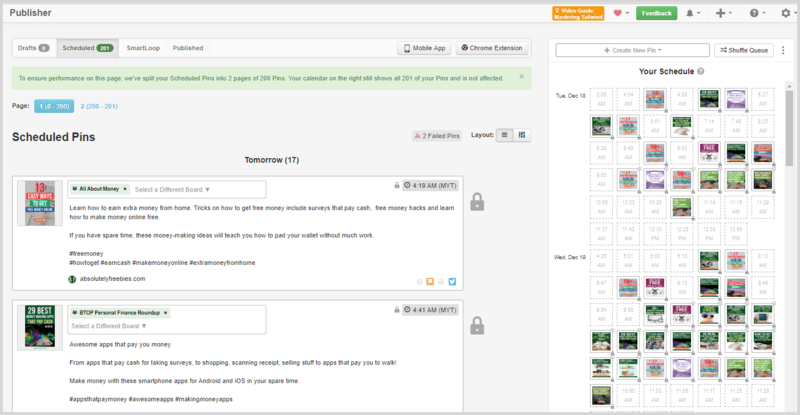 ShareASale – another affiliate network popular among bloggers. I hope you find value from my third-month blog income report. More importantly, I want to see consistent growth from month to month. If you enjoy this post and want to be kept updated, you can follow me on Pinterest and Facebook.